Paris Climate Accord: What's In It? : The Two-Way President Trump says he will pull the U.S. out of the 2015 Paris pact. Here's a by-the-numbers look at the details of that historic global agreement. The slogan "For The Planet" is projected on the Eiffel Tower as part of the United Nations Climate Change Conference in Paris in December 2015. 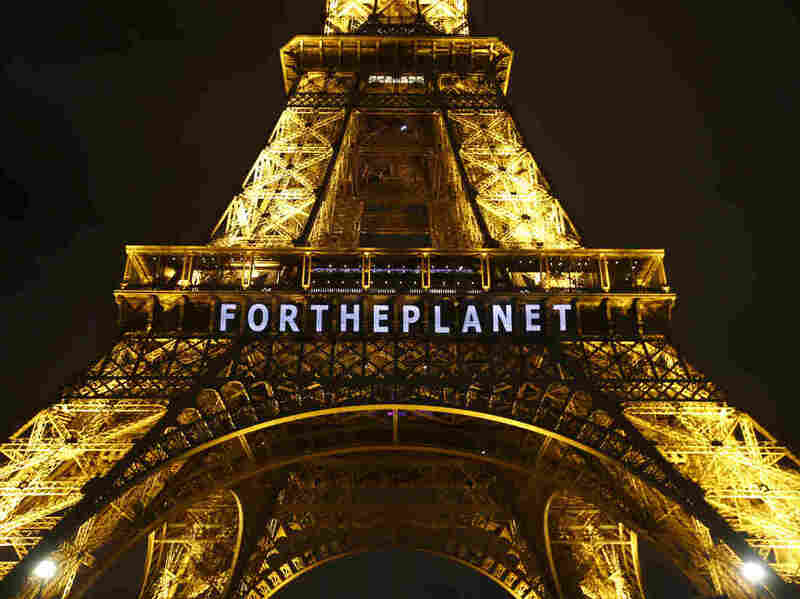 Editor's Note: This story was originally published in December 2015 and was republished with minor updates ahead of President Trump's decision to pull the U.S. out of the Paris climate agreement. Some of the information on approval by individual governments has been changed to reflect changes in status. Representatives from 196 parties made a historic pact on Dec. 12, 2015, in Paris to adopt green energy sources, cut down on climate change emissions and limit the rise of global temperatures — while also cooperating to cope with the impact of unavoidable climate change. The agreement acknowledges that the threat of climate change is "urgent and potentially irreversible," and can only be addressed through "the widest possible cooperation by all countries" and "deep reductions in global emissions." But how deep will those reductions be — and how soon, and who's paying for it? Here are some key figures from the final agreement. "Holding the increase in global average temperature to well below 2 degrees C above pre-industrial levels ..."
Limiting the rise in temperature to 2 degrees (3.6 degrees Fahrenheit) has been discussed as a global goal for several years now. That amount of warming will still have a substantial impact, scientists say, but will be less devastating than allowing temperatures to rise unchecked. The global average temperature has already risen about 1 degree Celsius, relative to pre-industrial levels. The current emission targets are just a first step, in short, and the Paris signatories hope the world can figure out how to get closer to the 2-degree goal as time goes on. That same sentence in the deal continues: "... and to pursue efforts to limit the temperature increase to 1.5 degrees C above pre-industrial levels, recognizing that this would significantly reduce the risks and impacts of climate change." That's right. The big, ambitious goal is immediately followed ... by a bigger, more ambitious goal. Small island nations, in particular, fought hard to have this number appear in the agreement, noting that even if the temperature increase was held at 2 degrees, the resulting rise in sea levels would be devastating for them. Island representatives adopted the oft-repeated motto, "1.5 to stay alive," as NPR's Ari Shapiro has reported. And while those vulnerable nations didn't manage to establish 1.5 degrees C (2.7 degrees F) as the legally binding target, it is worked in as an aspiration. But it's a goal that would be even harder to achieve than 2 degrees — which, again, is a target the world hasn't yet figured out how to meet. "To help developing countries switch from fossil fuels to greener sources of energy and adapt to the effects of climate change, the developed world will provide $100 billion a year," NPR's Christopher Joyce reports. But that amount is identified as a "floor," not a ceiling. "Developed countries won inclusion of language that would up the ante in subsequent years," he explains, "so that financial aid will keep ramping up over time." This one isn't exactly a number ... but it's the target time for "global peaking" of climate change emissions. It's an acknowledgement that in the near future, total emissions of carbon dioxide and other greenhouse gases won't fall — in fact, they'll rise, as developing economies consume more energy. But the plan assumes that greener technology, conservation efforts and processes to remove greenhouse gases from the atmosphere will eventually allow emissions to decline instead of rise — and at that point, the "peak" will be achieved. Nations aren't expected to ratchet their emissions back immediately. "Each country came to Paris with a voluntary pledge to reduce emissions," Christopher says. "The agreement now codifies that and sets a framework for those reductions to begin in 2020." That year is also the deadline for countries to submit a more long-term plan — not an immediate pledge, like their current goals, but one looking decades into the future. After the 2020 reductions kick in, it's not over: The deal is designed to evolve as the years pass. Every five years, specifically, each nation's targets will be reevaluated to move the world closer to the 2-degree target. "Targets must be submitted 9-12 months before they are finalized, creating time for other countries and civil society to seek clarity about the targets submitted," the Obama administration wrote. "Each target should reflect progress from the prior one, reflecting the highest possible ambition that each country can achieve. This durable, long term framework will drive greater climate ambition as technologies improve and circumstances change." This target date isn't actually precise: The deal describes it as "mid-century." Zero, as in net zero emissions of greenhouse gases. "Any greenhouse gases emitted would be balanced or zeroed out by removing an equivalent amount from the atmosphere. In the case of carbon dioxide, that would presumably be accomplished by growing forests, which absorb carbon dioxide." Diplomacy isn't always quantifiable. Many sections of the deal, of course, don't nail down any numbers at all. For instance, nations around the world "should strengthen their cooperation on enhancing action on adaptation" to the effects of climate change, the agreement states. "All Parties should cooperate to enhance the capacity of develop country Parties to implement this agreement," it says elsewhere. And "Parties shall cooperate in taking measures, as appropriate, to enhance climate change education, training, public awareness, public participation and public access to information." A total of 196 parties committed to the climate deal in 2015 and had a deadline of April 21, 2017, to officially sign on to the agreement. At least 55 nations — between them accounting for at least 55 percent of the world's total greenhouse gas emissions — needed to formally approve the pact before it went into effect. That threshold was reached on Oct. 5, 2016, and the accord kicked in 30 days later. A correction appended to this story was, in fact, incorrect. The difference between 2 degrees Celsius is indeed 3.6 degrees Fahrenheit as it was originally written. Additionally, a previous version of this story said 196 nations agreed to the Paris accord. In fact, the 196 parties included the European Union, which is not a nation.